Happy humpday lovebugs, we're getting there. Today we're looking at a new trend in jewelry that I just love because I think you can mix it in with any style. The gold knot. It's a solid and simple design that can be dressed up or down. Oh how simple and stunning is this? This bracelet is just screaming for an LBD. So chic and grown up. You know I had to throw in some Kate. These little studs would be perfect with jeans or a pencil skirt. This necklace has a little bit of an edge. I think it's the chain that encompasses the simple knot. 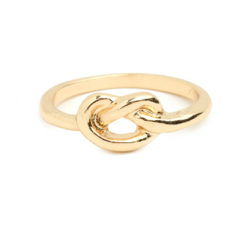 The simple gold knot is a strong piece that shows confidence and sophistication. Wear a big statement necklace or a simple ring, it will always be a beautiful accessory. Oh... I love this idea. I think the J Crew Bracelet is my favorite.